It has been extremely hot in my house lately so I’ve been reluctant to turn anything on in the kitchen. I generally don’t care for salads because it leaves me hungry most of the time. But because of the weather, I made an exception. I paired this salad with a slice of Savory Ham Cheese and Olive Cake (recipe to come soon) and it was the perfect light meal for us. The cucumber and tomatoes combined tasted so refreshing that I’m beginning to have second thoughts about salads. Have stellar Tuesday! In a medium bowl add cucumber, tomatoes, chopped shallots, parsley and dill. Drizzle balsamic vinegar and extra virgin olive oil on top. Then season with salt. Toss salad and sprinkle feta cheese and cracked pepper before serving. I love this! 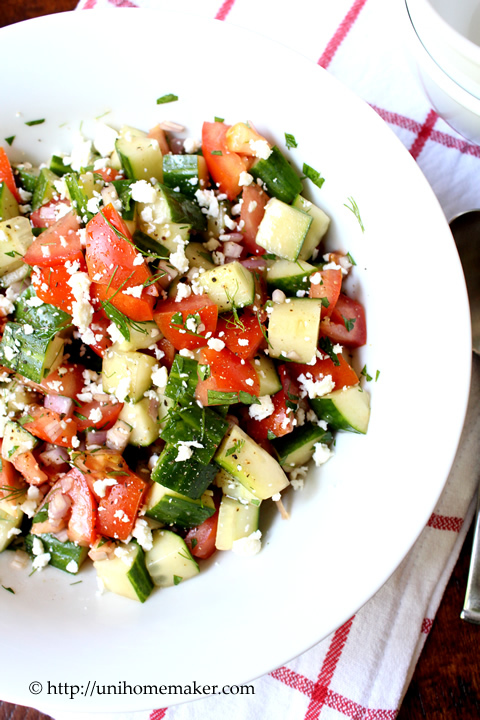 The perfect summer salad, and using my favorite herb too! Oh I like how the colours in the salad just pop! The cake sounds a little like a savoury cake with olives and goats cheese that I made a while ago (but haven’t got round to posting yet), look forward to that recipe too! That’s one of my favourite summer salads! Salads like this are so fresh and clean, and their simplicity is what makes them so good! I love all of these flavors…delicious! Great healthy salad and beautiful pics! This is a cool and easy salad and a nice change from the traditional salad. Try it! Your salad is so perfectly cut and tossed. I can taste the flavors! This is one of my favorite flavor combinations and especially coated with olive oil. So fresh. 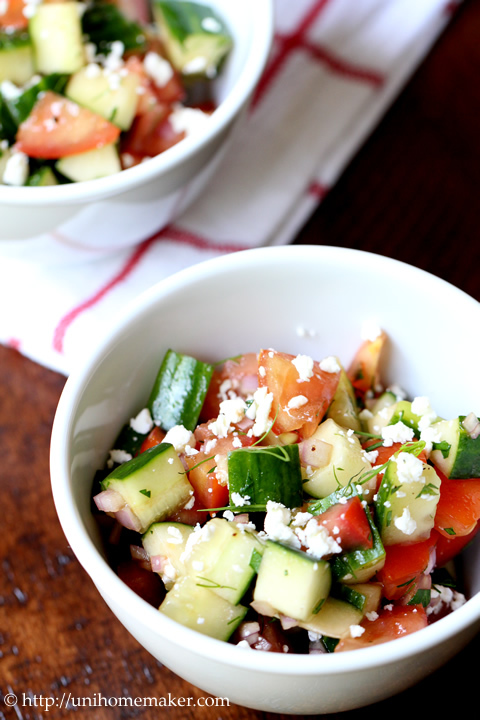 Perfect salad to beat that summer heat! We usually don’t do salads for dinner but with the weather lately I’ve been craving them. Especially ones with tomatoes and cucumbers – so refreshing! This sounds fantastic! I love that there’s dill in here too – I need to use it more often. At first I thought this salad might have a lot of acid in it – I didn’t know what the dressing was made out of. But the first taste was heaven. It has a lot of flavor, but nothing overpowers the natural flavors of the cucumbers or tomatoes. It all just came together quite nicely. Definitely making these next weekend! OOh, this looks so simple, delicious, and refreshing – totally my type of hot-weather snack. YUM! This is one of my favourite salads ever! Yummy! This would be fabulous with the ripe summer tomatoes I’ve been buying at our produce stand. You dinner sounds perfect!!! The photos look as refreshing as the salad! Will pin! Like you, very often I find salads to be lacking. When Summer is at its most brutal, however, I don’t mind them at all, Your salad here, for example, with its bright colors and fresh flavors, would make a perfect meal on those days when use of a stove is out of the question.Looking forward to your recipe for the Savory Ham Cheese and Olive Cake. I love salads like this! They are so delicious, fresh and healthy! An all around winner. Pinned! Hope you have a great week, Anne! 🙂 My weekend will be here early. I am taking Friday off because my mom is coming to visit for the weekend! Way to tease that savory cake, Anne! Now I’m loving this salad AND the dish you served alongside it. Lovely and refreshing! I love the dill in it! i’m usually not that into salad either, but anything with feta sounds good to me!! I love fresh veggie salads in the summer! This sounds so refreshing and delicious. I’m so making this next week!! This is one of my favorite summer salads. I usually add mint to it but will try dill the next time. I make a really similar salad often, but usually with goat cheese. 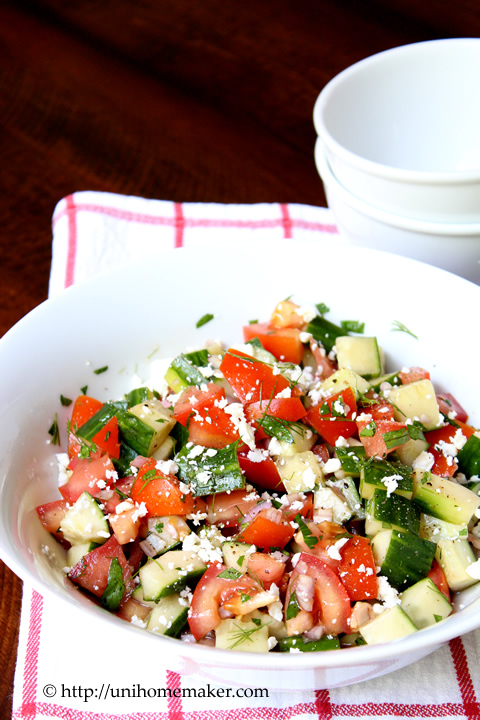 Feta would be wonderful – I need to try that. I sometimes substitute basil or thyme for dill, too, but we have so much dill growing it tends to find its way into everything! Good stuff – thanks. 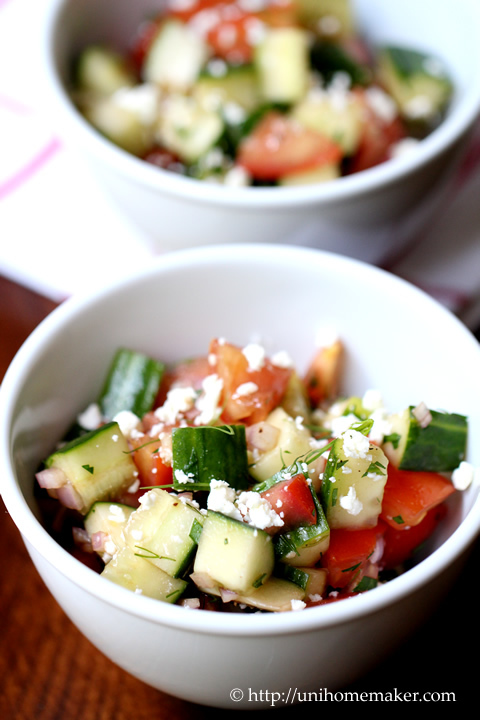 I love greek salads like this, Anne! Yours looks so cool, refreshing and perfect for serving next to grilled chicken. Great recipe! I love this salad! And I can’t wait to see your savory ham cheese and olive cake recipe! So fresh and tasty! I look forward to trying this. What a gorgeous salad! This definitely looks like something that I could make with our next CSA delivery! This has to be the most perfect summer salad Anne! So vibrant and colorful! A delicious way to cool off! Please answer the last 11 questions asked by me, nominate 11 other new bloggers. ask them 11 questions of your choice and do post all this in your blog…for example the way it’s posted in my blog… Glad to nominate you 🙂 Have a great day!